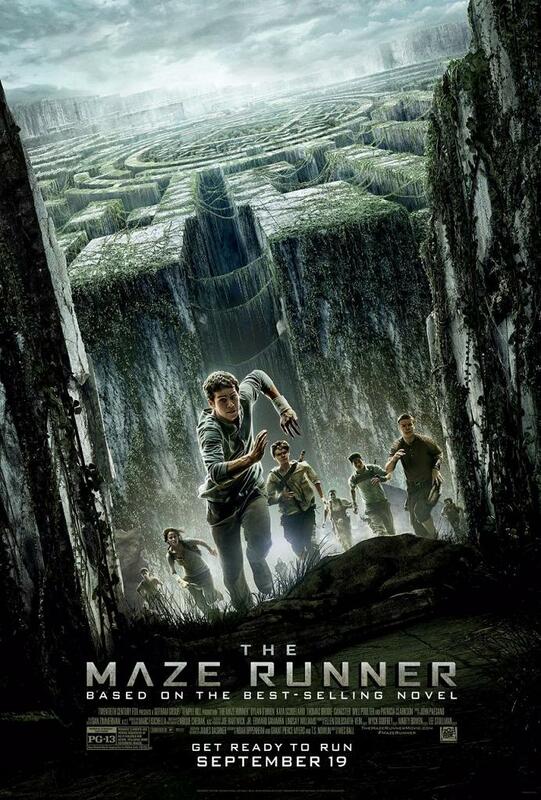 The Maze Runner is a film adaptation based on James Dashner's best selling novel. 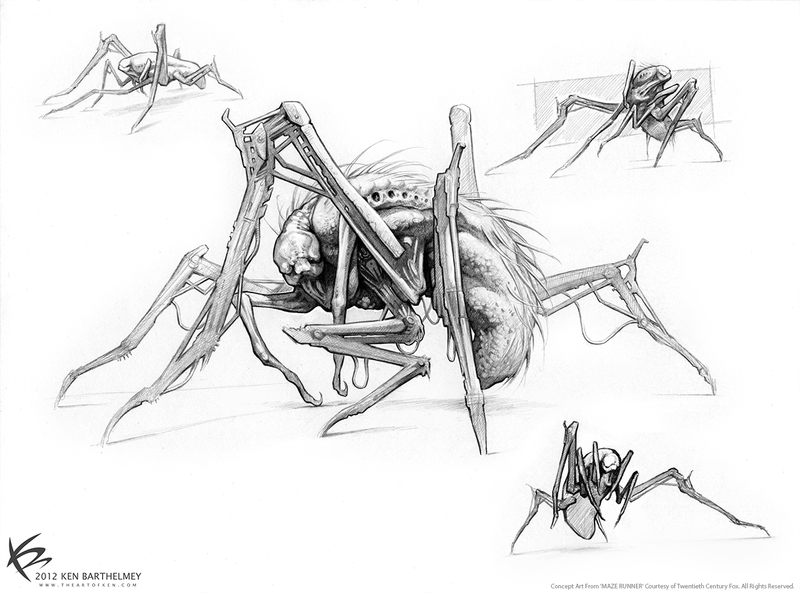 My main involvement was to design the scary creatures called 'Grievers'. 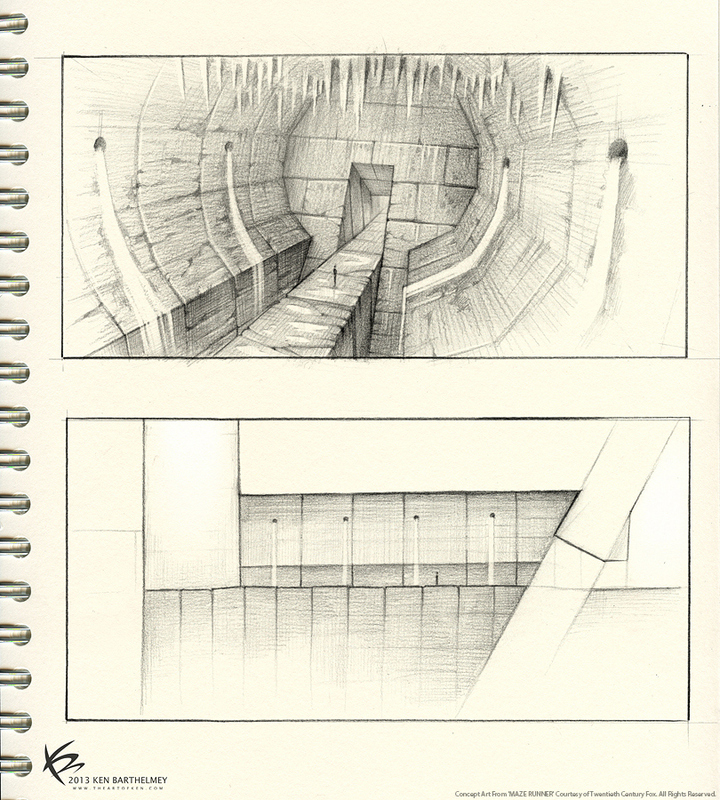 I also worked with director Wes Ball on several maze designs and other very interesting stuff. 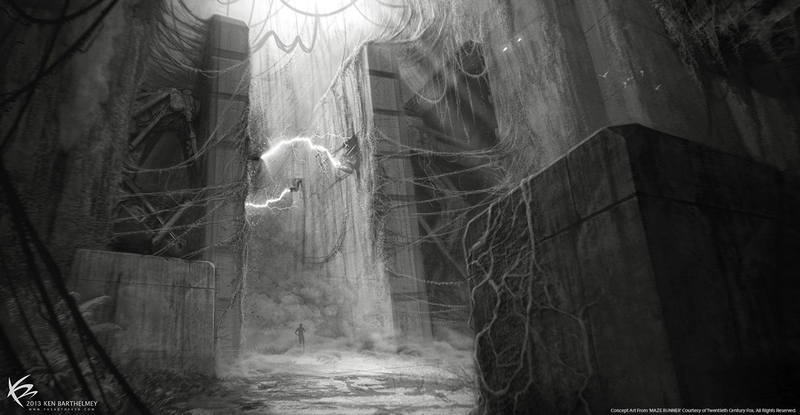 The mysteries of the Maze hold them hostage. 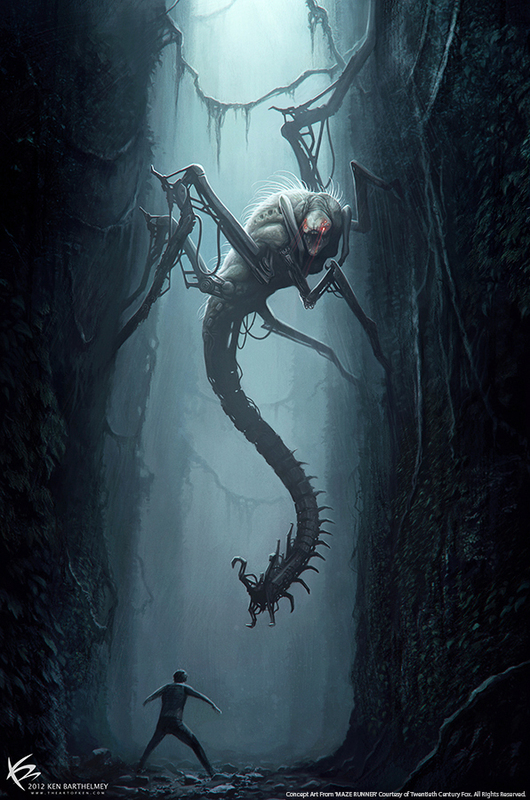 Watch the official trailer for The Maze Runner. 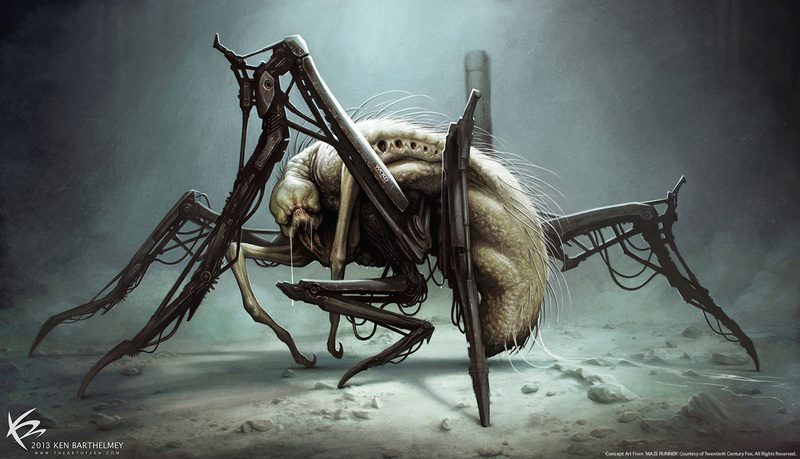 At the very beginning it was planned to make the Grievers as big robotic machines. 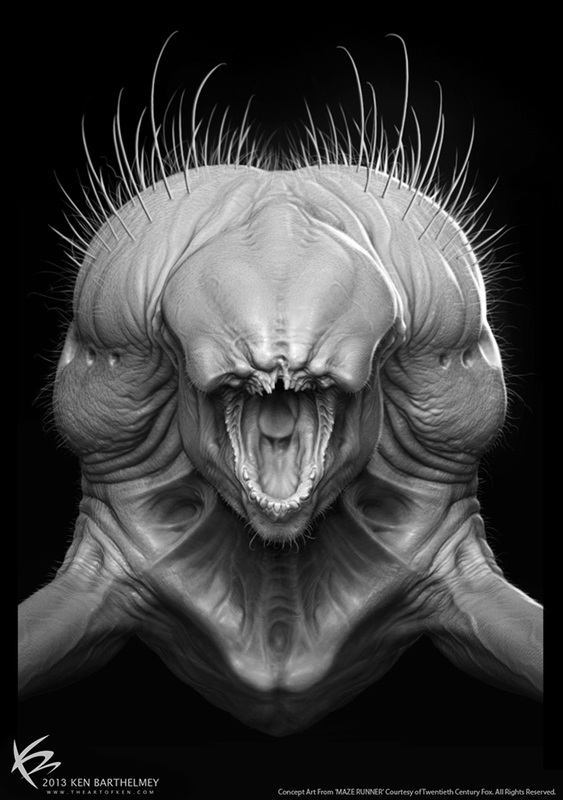 However I had already created this Test Design, before I got the job, which showed the hybrid creature idea from the novel. I presented the design to Wes and he loved it. 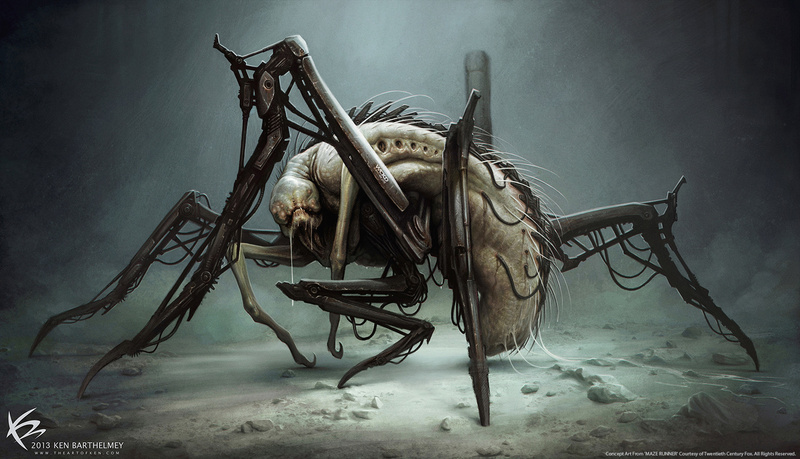 We collaborated on a few changes and attachments afterwards in order to enhance the final Griever design. 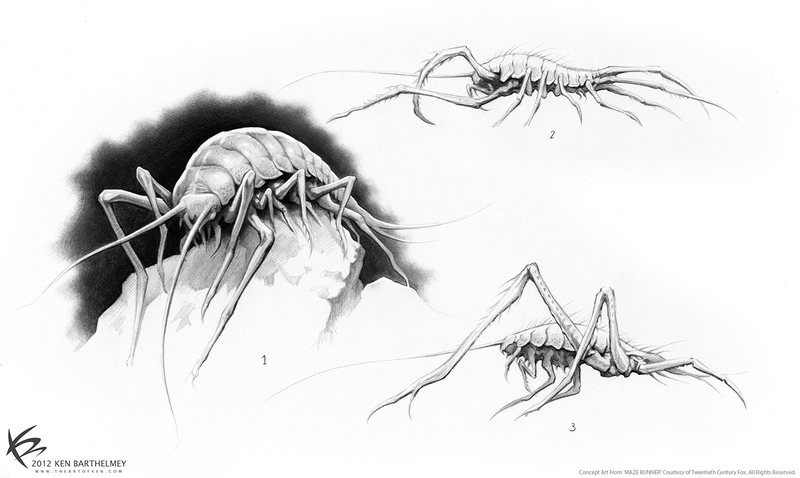 Slugs and coconut crabs were a huge influence for me in finding the overall body shape. 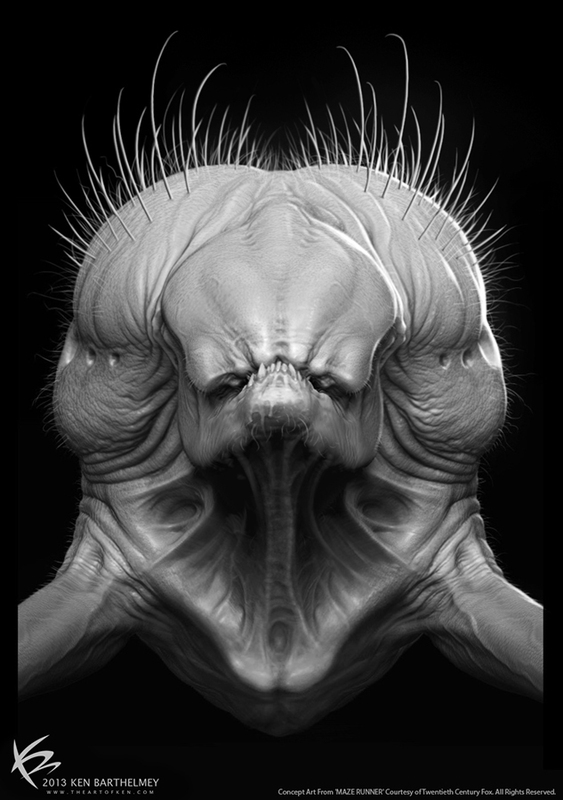 The head was a bit tricky, since in the book they have no face, only a big ugly mouth. It's basically a mixture of caterpillars, bulldogs and even piranhas. 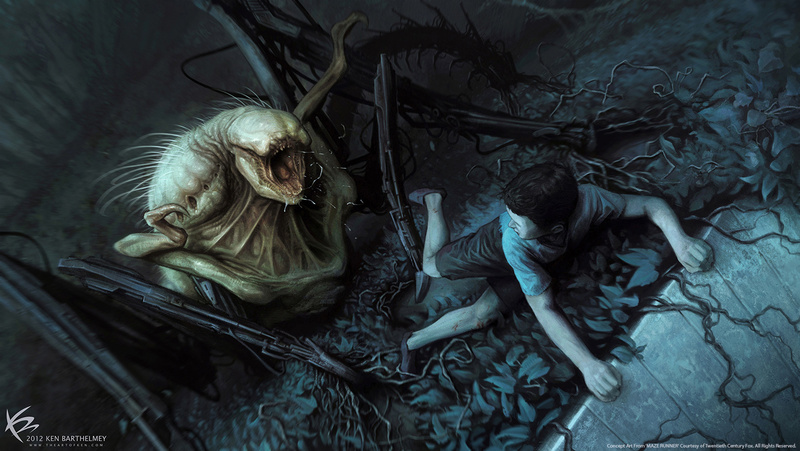 In the novel, the Grievers are described as huge bulbous slugs. It was pretty challenging to turn a cute slug into a bloodthirsty beast. Additionally, I tried to come up with an interesting anatomy but which is still based on these animals. 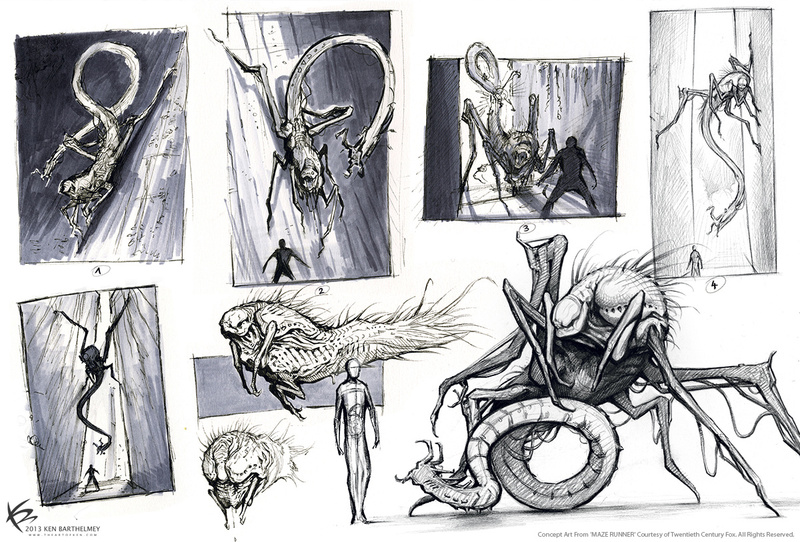 I did plenty of these different pose sketches, which illustrated how the creature could move. 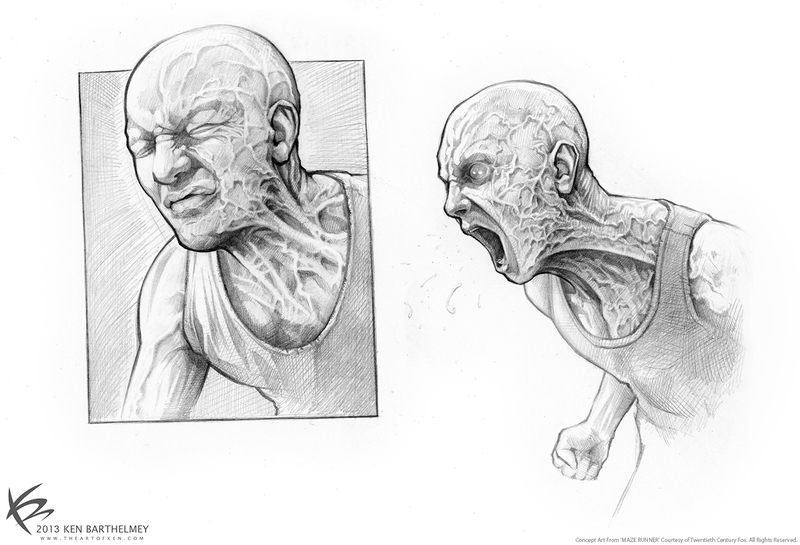 The wizards from Method Studios enhanced the movements to perfection. 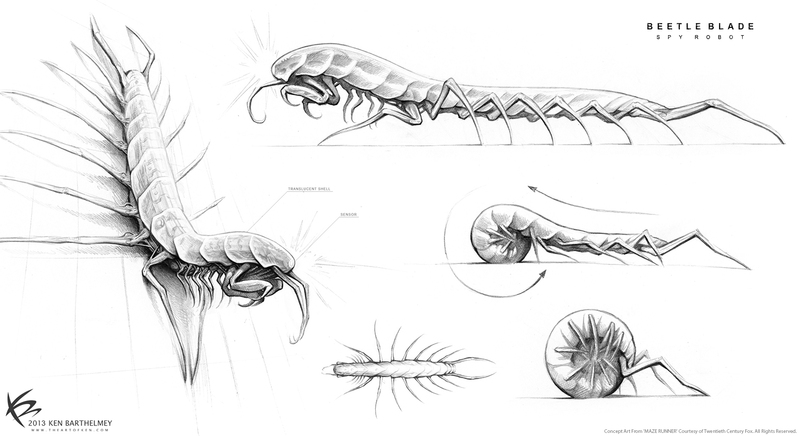 Wes already had many cool action scenes in his mind, therefore he asked me to add a mechanical scorpion tail into the Design. I also made the body structure much lower on the ground and adjusted the little arms along with some other details. Here is the final colored hero design, after some changes. 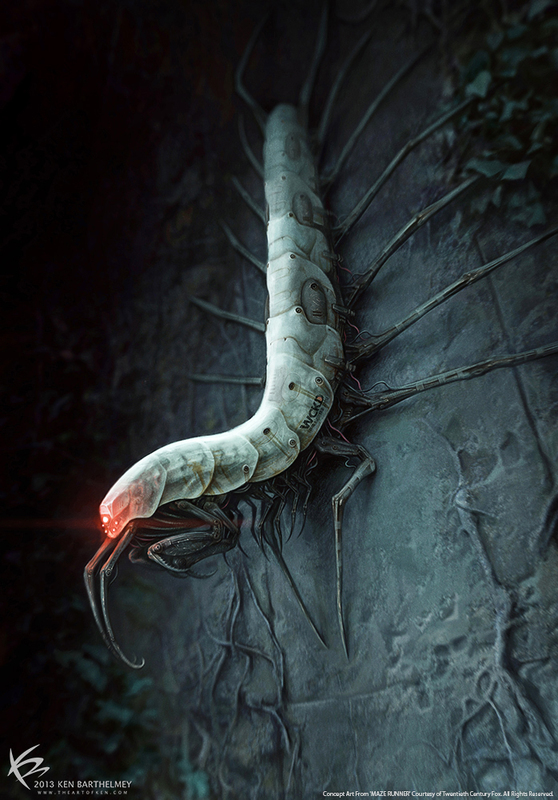 Since we see the Grievers mostly in the dark, Wes wanted to find a way to illuminate them with some kind of 'light dots' and sensors. This is one of a few options that I had sent to him. 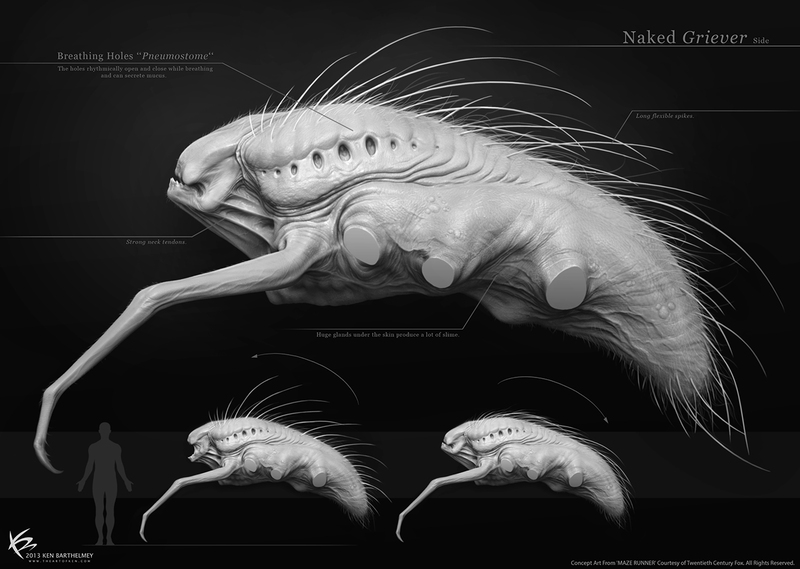 One idea was to put these lights underneath the slightly translucent skin which would constantly move in one direction. 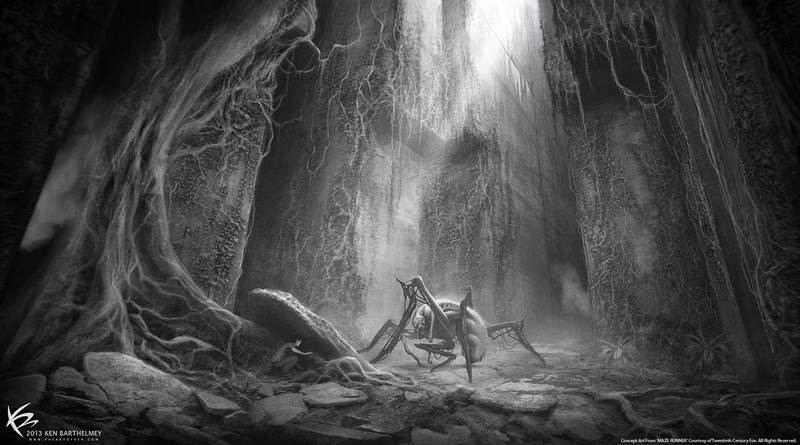 After the design was almost done, Wes asked me to create an illustration showing a Griever inside the maze. 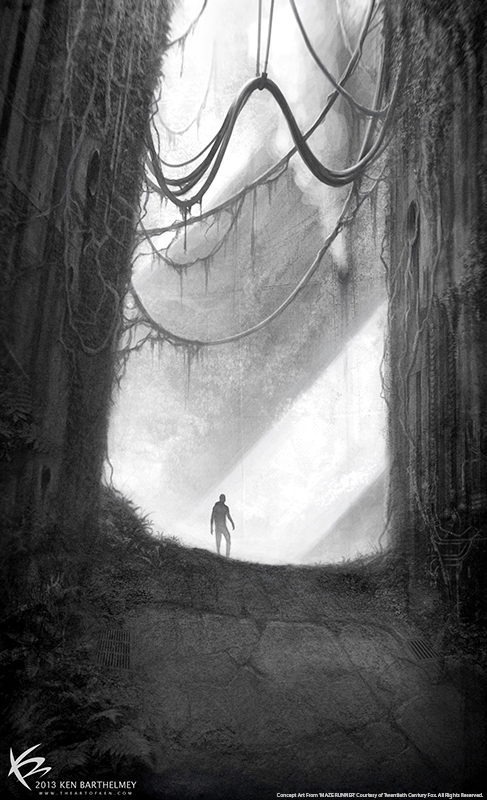 I drew some different ideas, it was at the same time my first maze concept. Some of my rough pen and copic scribbles. 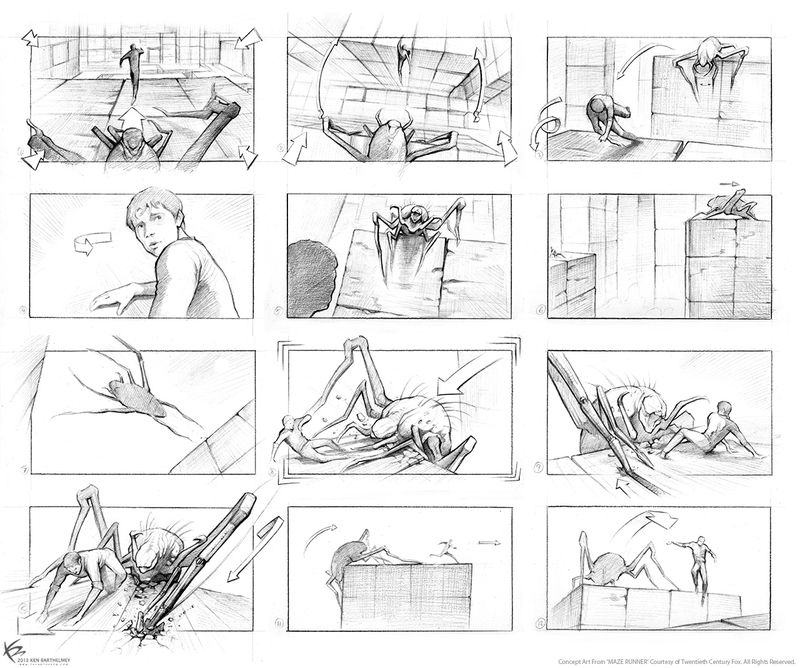 This keyframe shows Thomas trying to escape a Griever by climbing up a wall. 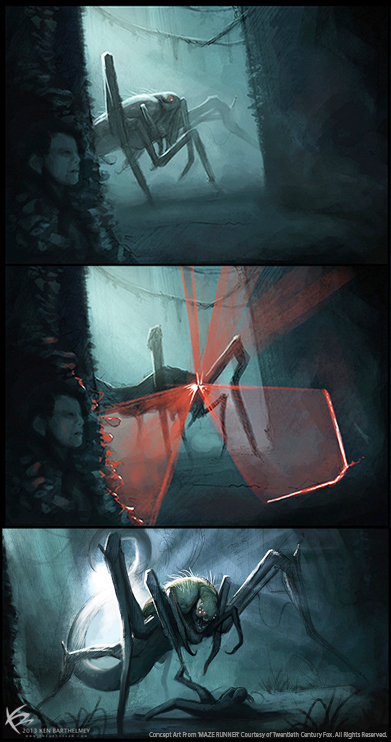 Some fast color thumbnails, showing a Griever inside the Maze. 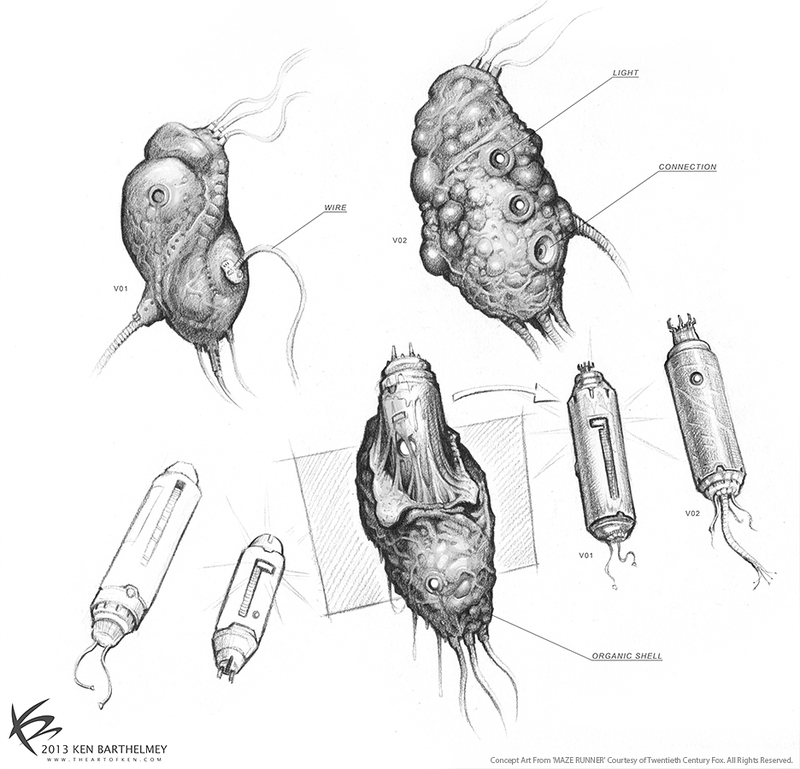 The kids find this 'Black Box' device in the squashed Griever body, so my idea here was to put it into a soft organic shell. It's nice to see this little detail in the film. They didn't end up in the film, but I had a blast working on them. There were a few cool scenes in the script. 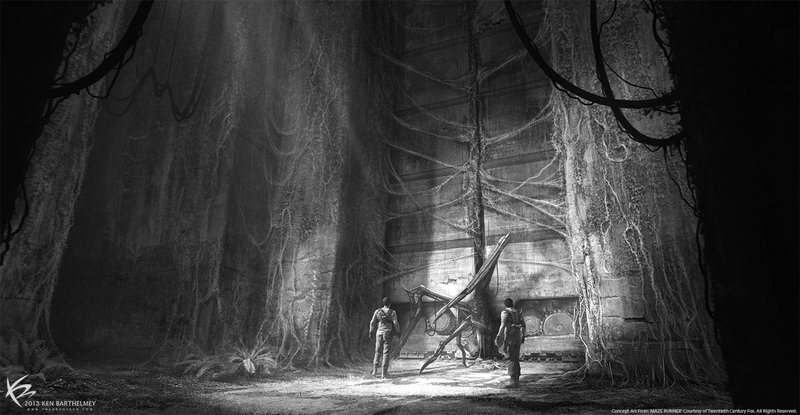 Wes described them as the 'observation cameras' from the maze. I attempted to make the design very functional. I had much fun working on these. 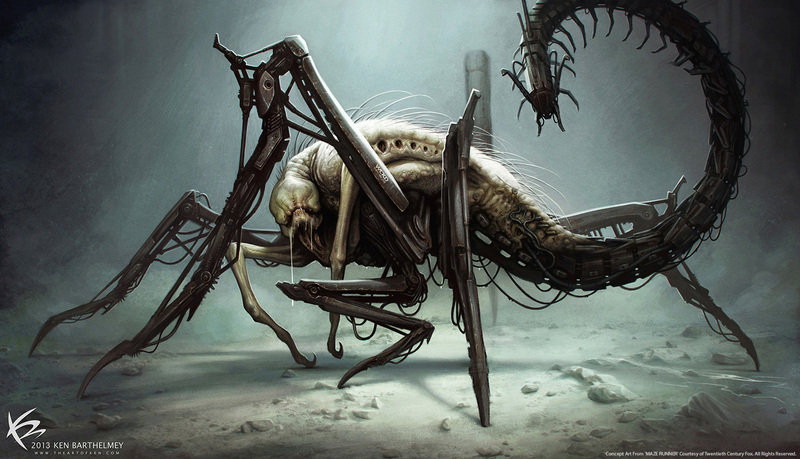 At the very beginning we was thinking about making them bio-mechanical, similar to the Grievers. 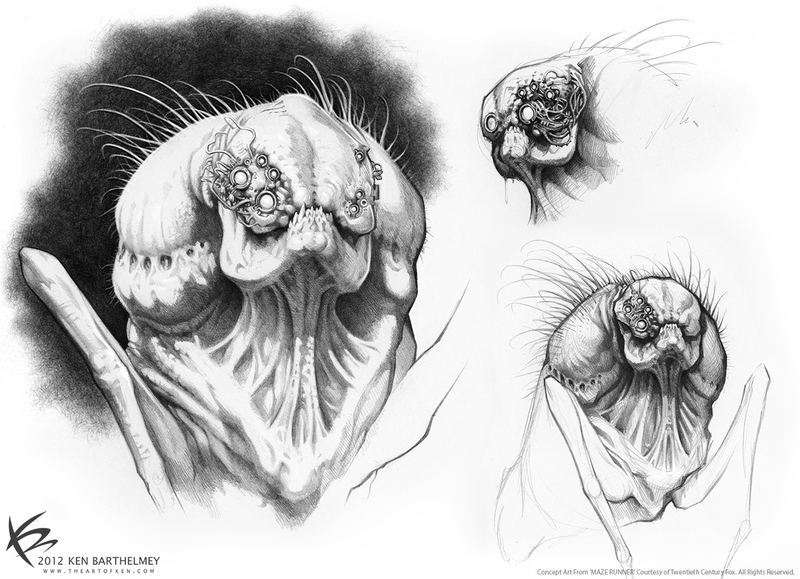 Wes wanted something like a mutated and scary looking sowbug. 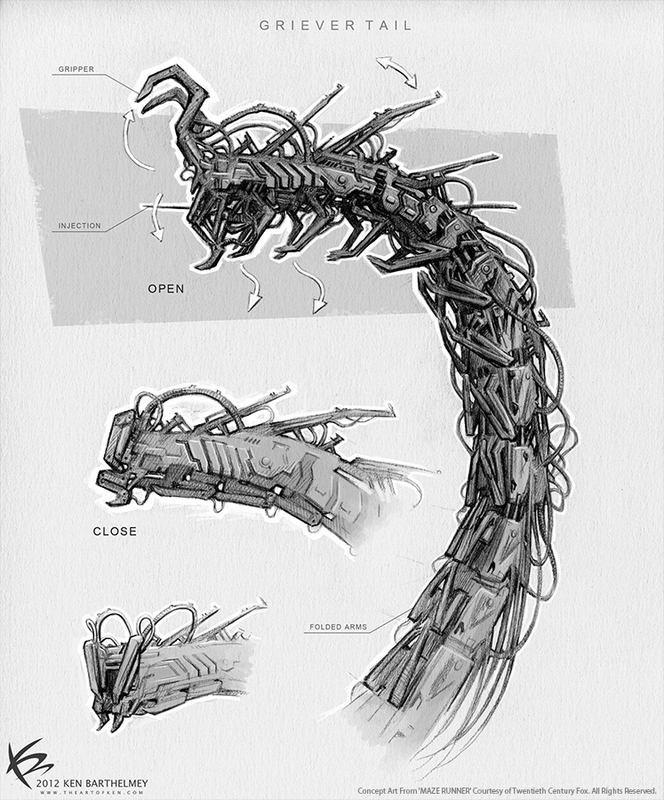 They ended up as centipede-robots, however I tried to give them a scary organic look. 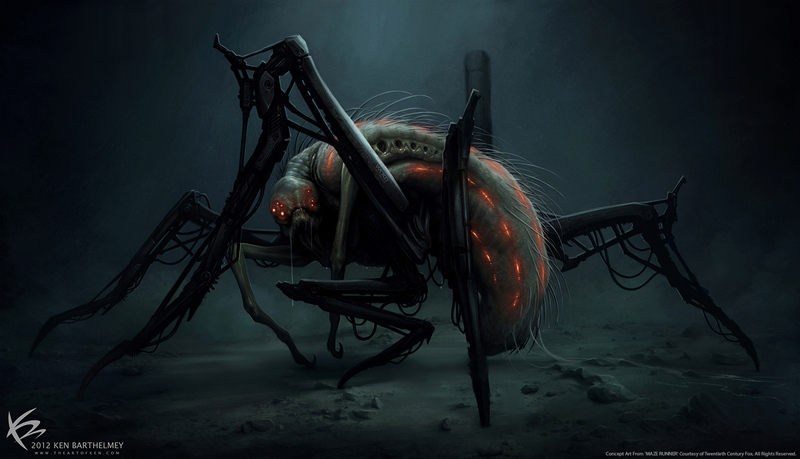 They have a translucent shell from where we can see all the machinery inside its body. This was originally my take on the 'Changing', based on the book descriptions. 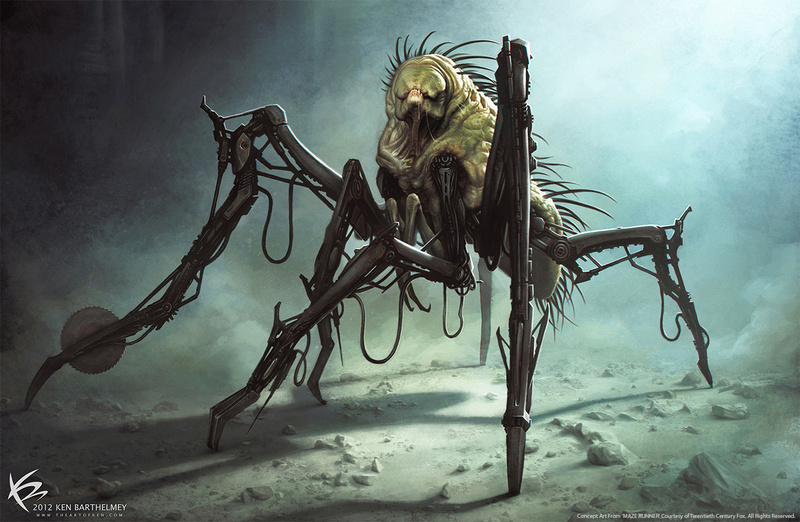 The design got used right away for the Cranks, which is basically the same in the film. 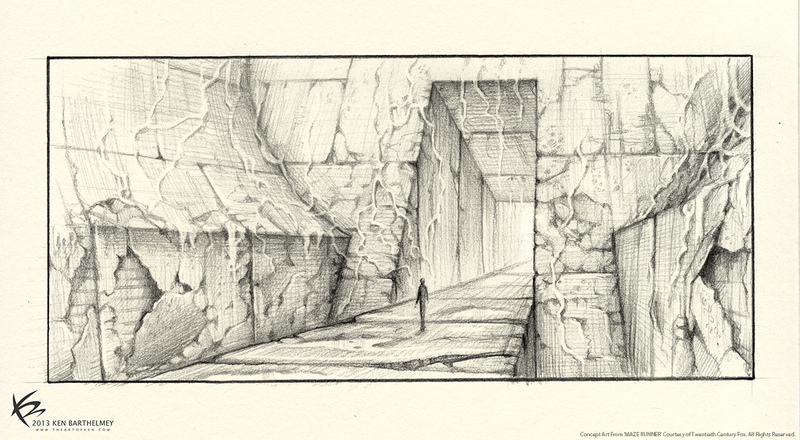 Pencil Sketch of the Griever Hole entrance. 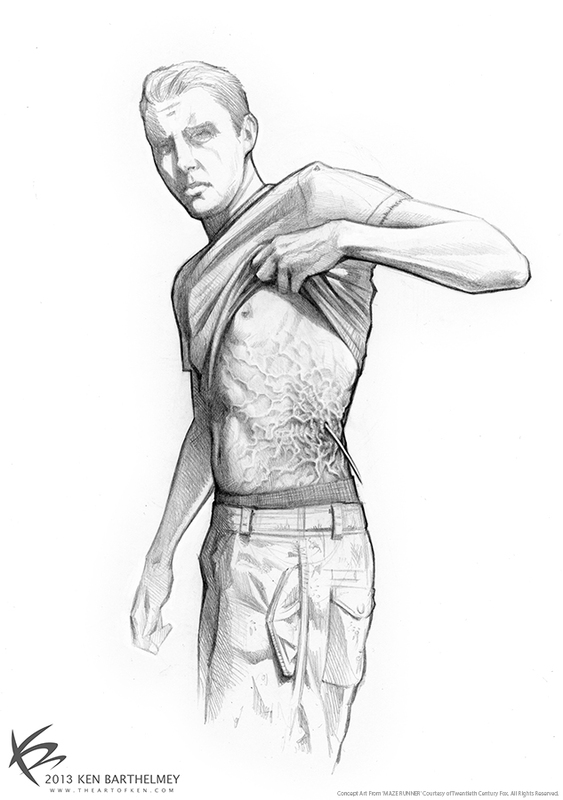 Pencil Sketch of the 'Griever Hole'.